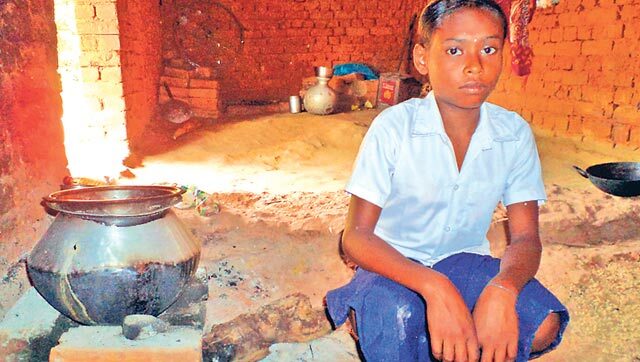 Sombari Sabar, 11, a tribal girl who lost both her parents, lives alone, sells firewood for a living and regularly attends school. Anil Rai, a teacher at Astakwali upgraded middle school was all praise for Sombari. He said, "Sombari is a little wonder. She lost her mother at a young age to tuberculosis and her father Ratan Sabar died a month ago. None of her relatives came forward to support her. She stays alone in a dilapidated half-constructed Indira Awas. Sombari never fails to attend school. She is studying in class 5 and has full attendance." After finding out about Sombari, many non-government and private organisations extended a helping hand. Tata Steel and the Ananda Marg Ashram want to adopt her. Dumuria block development officer Mrityunjay Kumar said, "Apart from some organisations, a banker from Syndicate Bank Jamshedpur and a teacher couple from Ghatsila have applied for adopting the girl." He said, "All applications were forwarded to the district authority. District child protection officer Chanchal Kumari will visit Sombari on Monday and decide on a suitable home for her." Sombari said, "It was my father's dream to make me literate." Maoist-hit Astakwali is 12 km away from Dumuria block of Ghatsila sub-division in East Singhbhum. Sombari's house does not have an electricity connection nor can she afford a kerosene lamp. At present Sombari is busy in her father's Sraddha ceremony or rituals after death. Sombari said, "These days I am collecting firewood and Sal leaves from the forest, so that on the day of the feast there is no dearth of wood or leaf-plates."